The item Stronger longer, Volume two, (evideo) represents a specific, individual, material embodiment of a distinct intellectual or artistic creation found in Charlotte Mecklenburg Library. 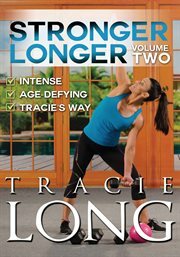 Fitness Celebrity Tracie Long (The Firm) is back with unique and age-defying workouts designed for staying Stronger Longer. Where Volume One leaves off, continue with more heart-pounding Intervals and Combinations to benefit your Core and improve Balance and Posture. Conquer fatigue and go for optimal personal strength with "Stronger Longer Volume Two."